The boy and the man. 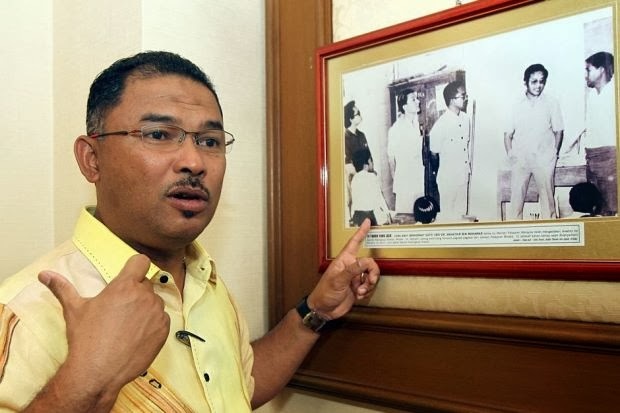 This picture shows the Chief Minister of Melaka Idris Haron with an old "hallowed" photograph. "It reminds me to be humble," he tells the Star columnist Jocelyn Tan. Find out why the black-and-white is so keramat for Idris, who recently came under fire from some quarters for a blunder thatn nearly got some trainee commandos and their trainers being awarded with the Pingat Gagah Berani for getting lost at sea, h e r e.
p.s. I don't think Apanama and the other critics are going to change his mind about Idris too readily, though. We all have seen too many "humble" politicians turned into monsters after having tasted power. Idris like Ali Rooster is just another brainless UMNO f*king parasite. Yes bro, you can see that in the UKRC field issue by the Selangor Pakatan Rakyat government. MB Selangor became monster and Sari Sungib became dinassor. Election promise broken, field got stolen. Most PR politicians are liars. Steven Lee, you are right. But before Khalid Ibrahim, that Khir Toyo had become big headed also. He started off very humble, humbler than this Malacca CM even, but in the end look what power did to humility! Thank you Dato, for forwarding this (JT's) article about Idris Haron. It gives an insight to the man and it is very positive. Rakyat wants to know about our leaders and were very happy to learn about this humble and praying CM (not that other leaders are not performing Muslims). I pray Idris stands to his humble beginning; to withstand the seduction of power and wealth (coming) from the CM's chair. My malay friend used to say he has' nt seen that pot of gold yet!...Soon his greed will override his reputation...show us one bloody honest CM in BN states past and present ? Anon 11.40, it's good you brought up Dr. Khir Toyo bit. A dentist of Javanese descent plucking from obscurity by Dr. M. to be Chief Minister of Selangor. His father was an ice cream seller. Very humble beginning indeed. His is an example of a Malay success story. Numbed after losing Selangor to the opposition, He was repeatedly sued and relentlessly humiliated. None of his comrades in Umno was around him to lend him a hand during those difficult periods. He was a lonely guy from the beginning till the end. He ended up a broken man. It's strange. After Mahathir left, there's no more camaraderie in Umno. Everyone just look after themselves. It is not part of Malay culture but it happened. When you are left with nothing, nobody even bother to look at you anymore. It was a piety of him. So guys up there. Be mindful. show us one bloody honest CM in Pakatan states also. same la..
Idris Haron kata dia kena tipu dengan Cina. Mereka janji nak undi tapi undi Cina DAP. Apa jenis melayu ni. Bodoh kena tipu Cina. Kita mahu Melayu yang bijak dengan tipu helah Cina. Kalau dah siang-siang kena tipu Cina jangan harap lah esok dia makan duit Cina macam Ali Rustam je.. bleanja kahwin free konon..no such things as a free lunch. Red bean army dah mula buat kerja. The fuc-er kat penang tu bagus sangat ke?